It was a crazy day. Nonstop tasks. Nonstop appointments. I raced from place to place, from task to task, and by evening my shoulders were hunched up around my ears. Though my accomplishment list was long, I was so seriously wound up from nonstop rushing that my jangled nerves had a hard time settling down. Every taught muscle ached. Warp speed days. Sound familiar? Though that particular day was not typical for me, for many women our days can frequently be nonstop. We rush, we undertake, we accomplish. And then we collapse. May I give you permission to slow down, exhale, close your eyes, and just breathe? Steal away for a quiet moment and let your heart connect to God’s. Let Him breathe fresh strength into your weary soul today. You are my awesome King. I love and adore You, Lord. And I come to You, weary. Please give me great grace smack in the middle of my nonstop days. Right now I pause and allow my weary heart and body to focus on You. You are so good. You are faithful and mighty. You are gracious and You know my every need. Will you please infuse me with Your revitalizing strength? Give me wisdom and help me not to overload my schedule during the upcoming hectic season, and to schedule down time for myself. When I’m faced with an unavoidable nonstop day, equip my heart throughout the day and, as I look to You, please ease and relieve and refresh my soul. 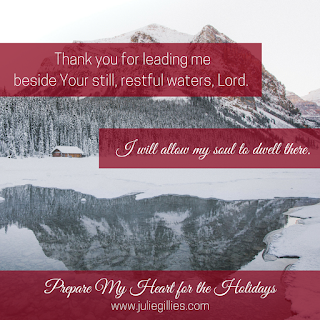 Thank you for leading me beside Your beautiful still, restful waters. I will allow my soul to dwell there. In the precious name of Jesus, Amen. Reading this post via email? Please CLICK HERE to ENTER and be eligible for the giveaway.